In preparation for an upcoming lecture on book boxes (May 23, 2013, 6:30) and workshop on drop spine cradle boxes (May 24-25, 2013) at Columbia College in Chicago, I’ve run across some crazy ideas on how to protect a book. The housing system below is noteworthy. Over 200 books at an NYC Institution were treated this way. The outer shell is an acidic marbled paper and a laser printed paper label. As you can see, it is difficult to unwrap the book without tearing the deteriorated paper. The laser printed label seems to date this treatment after the early 1990’s. 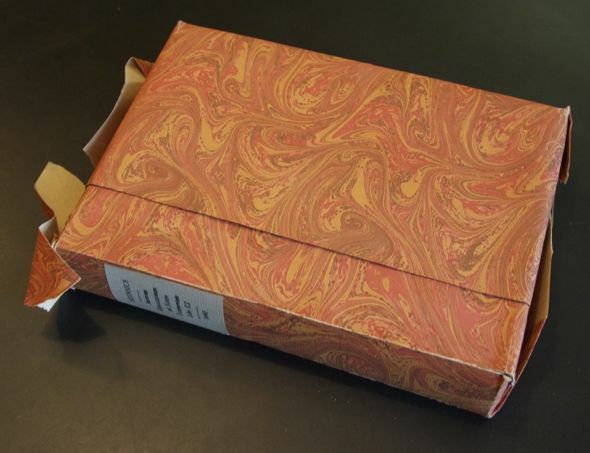 Is it my imagination, an accident, or did the person who wrapped this book take extreme care to try and match the marbled patterns at the join of the paper? The next layer is the big surprise: aluminum foil. 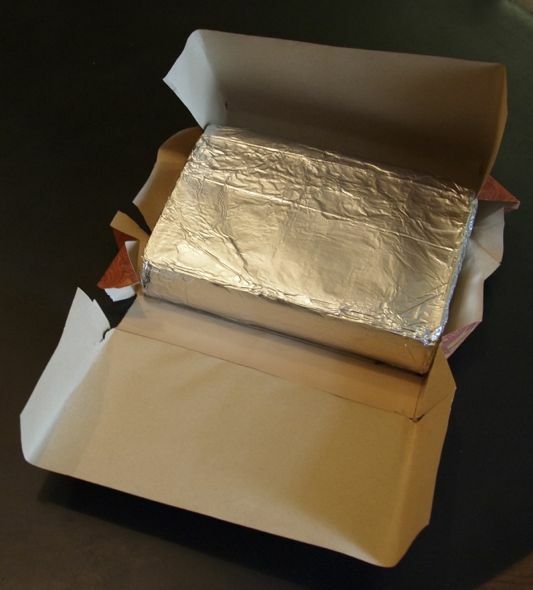 At the moment, I can only think of one reason for wrapping a book in foil, to prepare it for baking. I’m not sure what the Interactions between the aluminum and leather might be, but the mechanical problems are quite apparent, since the extra aluminum is rolled up and pushed onto the head and tail of the text block causing uneven stresses when the book is shelved upright. Again, it is unwieldy to unwrap. These books were also given an marinade of potassium lactate according to the treatment records. I think this must have caused some of the blackening and changes to the surface texture of the leather—they do look a little like they have been baked. Potassium lactate is used as an antimicrobial preservative in Hot Dogs. Putting potassium lactate on leather books is a very bad idea, though. Even though it is discussed in some older book restoration manuals, it has been discontinued because of the damage it can cause. Tom Conroy (in the first comment) dates this treatment to 1984. At least one conservation vendor in the US still sells it, though. 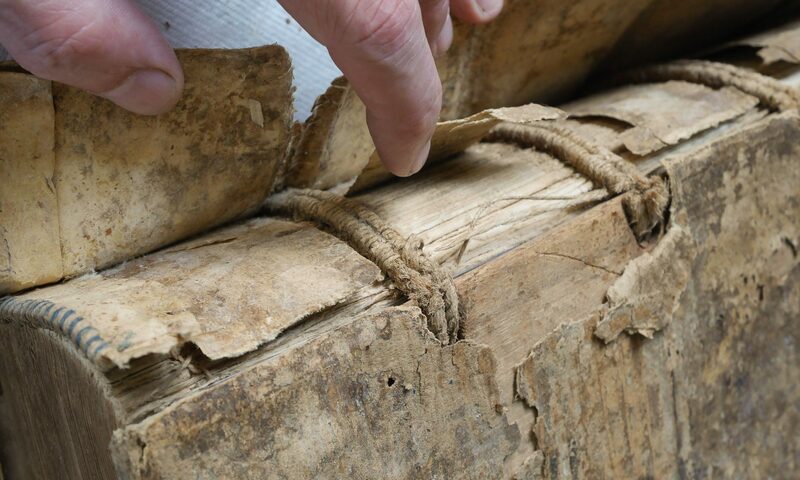 The best way to preserve leather bindings is to put nothing on them. If there is already red rot, you should consult with a book conservator. Pass the ketchup. Do you mean remote access? Perhaps – telepathically, mind meld, or with divine (by deity of choice) intervention. Not via conventional networks, VPNs, G4, … Although, come to think of it there was a NISO webinar “Future Perfect: How Libraries Are Implementing Emerging Technologies” in which one speaker discussed books becoming nodes on a network, and speaking to each other on the shelves. Perhaps this book wanted privacy. A bit of a mixup here. Potassium lactate was used from, probably, the 1940s to the 1980s, primarily for the protection of new leather against the effects of sulfur in tannage and air pollution. It proved to be ineffective, but it was also probably harmless; its use was part of my own training, and I was taught to be very sparing with it, not using enough for the water in the solution to cause blackening of the leather. After it was condemned by the prematurely-halted British Museum long-term natural aging test, the next round of study was Betty Haines’ hasty and probably inadequately funded 1984 study. This suggested the application of aluminum salts to old bindings in a concentration and quantity that was equivalent to flooding the leather with a layer of water a millimeter deep. British Library binders quickly found that this caused terrible damage to the bindings (duh) and tried using a smaller quantity of greater concentration; but it had already been shown that the salts did not penetrate the leather sufficiently when the concentration was greater. A great big total flop. Faraday Innes’ excellent research, begun in the early 1930s and continuing into the late 1940s, was intended to produce reliable new leather for new bindings. He used observation of naturally aged bindings, long-term natural aging, and an oxidative accelerated aging test (the PIRA test). He concluded that the best vegetable tannages (sumac and acacia nilotica pods) had “non-tans” that resisted the effects of sulfur (the cause of red rot) and that soaking the leather washed out the protective non-tans. He hypothesized that various buffering salts could replace the washed-out non-tans in soaked sumac and acacia skins, and could protect leather of inferior tannage in the way that the non-tans protected sumac or acacia leathers. The PIRA test supported this conclusion, but in the early 1980s the long-term natural aging test showed after 39 years that the PIRA test was a poor predictor in this respect. Potassium lactate was abandoned because it was judged to be useless, not because of any damage it did. Innes had studied a number of buffering salts in various concentrations, and had recommended the use of 7% potassium lactate. Here the big failure of communication happened. In the context of Innes’ work, he was apparently recommending the use of a quantity of potassium lactate equal to 7 per cent of the weight of the leather, introduced late in the process of manufacture. However, his recommendation trickled down to binders as the use of a 7% solution (i.e. a quantity of potassium lactate equal to 7% of the weight of the water in the solution) to protect the leather of new bindings and even of old bindings. In new binding, I was taught to use the potassium lactate solution instead of water to wet out the grain side of the leather before pasting up. I’m sure this introduced the salt in so small a quantity that it did neither harm or good. For the treatment of old bindings, we dabbed on the 7% solution during cleaning and dressing, very charily so that the leather barely became damp, never wet. This was precisely to avoid the blackening (and shrinkage and hardening) of aged leather that gets wet. Again, I’m sure that this introduced the salt in so small a quantity that it did neither harm nor good. As to why anyone would flood on potassium lactate solution to the point where leather would shrink and blacken: my guess is that this was the result of using untrained and unsupervised volunteers to treat the books. I well remember one early 1980s meeting of the ALA in San Francisco (when I was in library school at Berkeley) where I tried in vain to convince a discussion group of librarians that a competent binder could do basic cleaning and simple repairs in less time than it would take him to train volunteers to do the same work, and that if the volunteers were unsupervised they would do a great deal of damage. The librarians refused to believe this, and didn’t care anyway, since allowing volunteers to “help” the books was good publicity for the library. My own teachers once taught a group of volunteers to do simple cleaning of bindings with a slightly damp sponge; they returned some time later to find that the volunteers had followed their instructions perfectly, but had never changed the water they were using, which had become almost black with dissolved dirt. People think that “washing” has to get things wet. I’d say that the date of the enclosure is no indicator of the date when the treatment did the damage. The books could have been treated, returned to the shelves in damaged form, and put into enclosures at a later date. Possibly at two later dates, the foil to hold the books together and, later on, the paper wrappers to make the shelves look nice. The wrappers remind me of the kind of thing that was being experimented with in the early 1980s; similar approaches can be seen in Hedi Kyle’s 1984 manual, though not exactly this folding pattern. People were churning out enclosure patterns left and right, in a sort of competition to find the best one; Hedi would sometimes design two or three new ones as a consultant for one library. The photocopied paper labels were in use by 1983, when I made my first LC-style dropspine box in a workshop at the Humanities Research Center in Austin; I still have the box, with its photocopied title “DOUBLE TRAY BOOK BOX”. In any case, it is the water in the solution that damages leather like this, not the salts, whether the salts are potassium lactate or aluminum. Ketchup would do the same kind of damage, maybe less quickly: a viscous poultice, with a lower percentage of water but with a greater quantity held in place on the binding. If my experience of deteriorated leather is right, even ketchup wouldn’t improve the taste. I say, hold the ketchup and mayo. 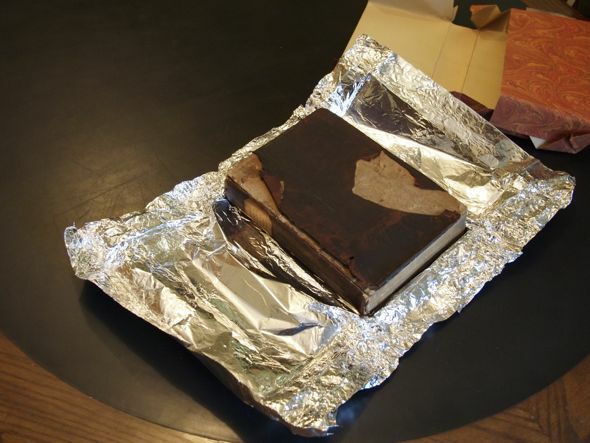 Perhaps the real reason why the book is wrapped in foil, is that the craftsman thought Aluminium foil would serve as an impermeable barrier to moisture and insects- after all, it is a thin sheet of metal- , and in the absence of anything more suitable ( or less expensive), our craftsman would have covered the volume in it. A similar excuse was used to justify the gilding of bookedges- The gold leaf would form a barrier to moisture, and thus protect the books.